7x Blades! All in good used condition, light use only, ready to go. Star Wars Lightsaber Lot . This is electronic lightsaber, batteries not included. Condition: 100% N ew, not Hasbro ,without box. It can make sounds and light up. Quantity:1 pcs. Mace Windu Star Wars Force Fx Lightsaber Hasbro Signature Series 2007.. Condition is Used. Shipped with USPS Priority Mail. 5 out of 5 stars - Mace Windu Star Wars Force Fx Lightsaber Hasbro Signature Series 2007. 18 product ratings18 product ratings - Mace Windu Star Wars Force Fx Lightsaber Hasbro Signature Series 2007. 7/8" Vaders Vault Neopixel Blade (scrolling effect) and Neopixel blade plug. Flash on clash, blaster defection effect, blade lock-on effect, force effect. Crystal Shard 4.5 sounds board with 3 sound fonts (16 color profiles ). This listing is for a Star Wars: Black Series - Mace Windu Force FX Lightsaber. Item is brand new. I am the first and only owner of this item. This listing is for a lightsaber from the 2007 build your own lightsaber kit. Lights and sounds do work. This includes 7/8" Vaders Vault Neopixel Blade! 2019 Star Wars Celebration Mace Windu Kotobukiya Exclusive Pin Condition is New. Shipped with USPS First Class Package. Mace Windu. All product is new (unless otherwise stated on the page). ~ Series 4 ~. I consider all of you friends and will give top service. I've got quite a bit of miniatures, so make sure you take a good look around. Hasbro Star Wars 2006 Mace Windu’s Jedi Starfighter. It’s in C-8 condition. Shipping will be calculated so please wait for an invoice. Keep on checking back as I’m still in the process of selling my whole collection. MASTER REPLICAS SW-302 STAR WARS EPISODE II ATTACK OF THE CLONES MACE WINDU LIMITED EDITION. 45 SCALE LIGHTSABER! RARE AND HARD TO FIND! RELEASED IN 2004 AND LONG SOLD OUT! STILL FACTORY SEALED TAPE ON THE PLASTIC COVER OF THE LIGHTSABER! Of course the Jedi Knight is hand painted and finished to the highest standards which Sideshow is famous for. No less wise than Yoda, Mace's presence is a reminder to all of the strength of the Jedi that flows from the Force. MACE WINDU IS CALLING! MACE WINDU will surely fit right in! CONDITION: Both lightsabers have been tested, and are in good working order. They light up, and make sounds as they move, and connect. Up for auction I have a Star Wars Mace Windu Episode III Lightsaber Hilt. It comes with a custom plaque, custom blade plug and custom case.This is a MR fx empty saber ready for a blade and electronics or a very cool display piece if you want to start collecting sabers and not pay 2 Grand for a master replicas signature edition version. Thanks for looking and May the Force be with You Always...... If you have need of other parts or pieces please email or get with me and I will see what I can do. Disney Parks Star Wars Build Your Own Lightsaber - 2007 original model Comes with purple Mace Windu blade, hilt, bulb, black sleeve & blue kyber crystal. Condition: Great preowned condition! TESTED & WORKS WELL! Payment is expected within 48 hrs of auction/buy it now end via paypal. All items are described to the best of my ability. I try to be as thorough as possible. If you have any specific questions please don't hesitate to email. ALL SALES ARE FINAL. No returns. No international bidders. HAPPY EBAYING! These are the flick open with wrist type. No batteries required. There are marks from play and lighter spots on the colored plastic. No major issues such as cracks, excessive wear, or foul odors. After doing a little research, I discovered that this saber was in fact released as part of the Revenge of the Sith toyline as Mace Windu’s lightsaber, despite its handle resembling that of Plo Koon. Up for auction is this Master Replicas Star Wars Mace Windu Lightsaber .45 scaled replica. I purchased this item used and have removed the lightsaber and items from the box a few times over the years, but otherwise it has been in the box and on display in a glass cabinet in a smoke free house. Shipping via USPS priority mail. $20 flat rate for packaging and shipping. No international shipping. Good luck and happy bidding! 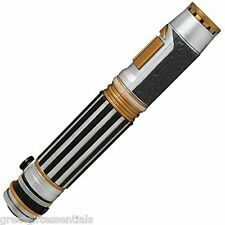 This Hasbro toy lightsaber is in preowned condition with normal signs and marks of having been played with. When a button is pressed on the handle the lightsaber sound is made and stays on until the button is pressed again. star wars Mace Windu Electronic lightsaber. Condition is New. Batteries not included Shipped with USPS Priority Mail. You get the item in the picture. Star Wars Mace Windu Electronic Lightsaber. -Paypal only. -Payment must be made 48hrs. after auction/sale ends. -No international shipping. -I will ship item within (2) business days after receipt of cleared payment. -Thanks for looking!! Pre-owned. No box. Includes light saber! Epitomize the power of the Force with the Mace Windu Force FX Lightsaber fromStar Wars The Black Series. A detailed replica of the Jedi Master's purple lightsaber fromStar Wars: Revenge of the Sith, it includes a display stand. White stress marks all over the blade. See pictures for condition details. This is the original error box that says "glowing bright red blade". TOY VAULT INC.
Celebration Chicago Exclusive Dealer Mace Windu Pin. Condition is New. Shipped with USPS First Class Package. Slide button on side and flick wrist to extend blade. This is the rarest and coveted lightsaber among Star Wars fans and is a prized possession. This item includes a belt clip. It is sturdy and very durable.